A telephone call from Kjeld Malthe Bruun, preconceived friendly opinions to everything coming from Norway-, started it all. He asked, if I possibly might think about a trip all around Denmark. He wanted Norwegian eyes, having a feeling for, and knowledge about Old Norwegian Spael Sheep, to have a look at those sheep staying in Denmark since 1981, trying to find out, if they really descend from the old coloured Norwegian sheep. Because of my earlier contact with the Danish "enthusiasts”, I was asked to be a deputy in the leadership of the Danish Association of Old Norwegian Spiel Sheep. This association was established spring 2003 at Lystbaekgaard in West-Jutland. Besides I live just outside the door of our Danish shepherds. We were like flying along the Danish heath land along the west coast down to the old town of Ribe, founded during the Viking age. Here we visited the Chairman of the association, Kirsten Kerrigan. We had our first meal of the day here. We hadn’t had time to eat before. Kjeld was irritated because of the delayed ferry, "Fjord Norway", which caused one hours delay on our schedule. 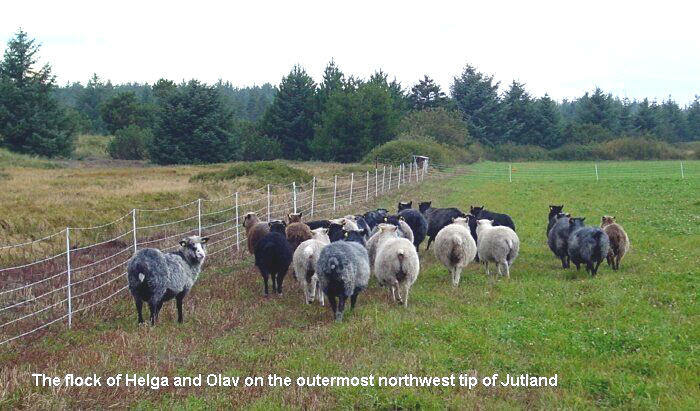 That because of our plan to have a look at Kjeld´s flock on Sheep-Isle. Anyway we got out there in the middle of no-where flying OY-PRZ, with Jes at the controls. 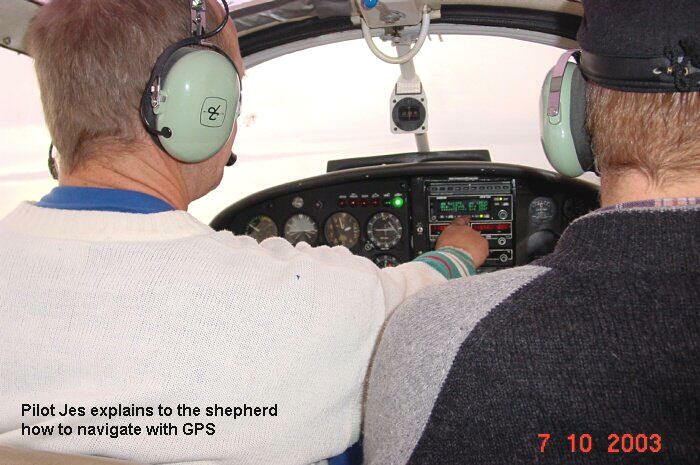 He made a nice left hand visual approach on Sheep-Isle, -the runway just some 210 metres! That was the climax of the trip, when speaking of excitement and history. The island of Hjelm (Sheep-Isle!) in Kattegat has been on the hands of Norwegian kings for twelve years, seven hundred years ago. And today a flock of Old Norwegian Spael Sheep including a ram, is grazing on this remote, windy island, stuffing themselves with herbs, seaweeds and salt water. 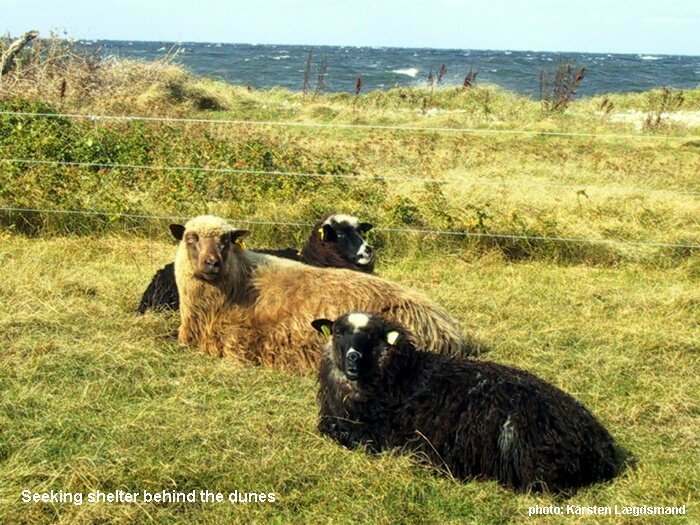 Absolutely every Old Norwegian Spael Sheep in Denmark comes from two well-documented imports from Norway in 1981. Twenty lambs and one ram lamb was bought from Viktor Nedrebø in Bjerkreim on the Southwest coast of Norway. They were picked from his best sheep. The next 25 fertile sheep and a ram were bought from four different landowners in Telemark.The result is that today you can find in Denmark 450-500 old Norwegian sheep, directly descending from those brought to the country in 1981. I have seen myself during those two days that something more Norwegian than those excellent beautiful coloured sheep can never be seen on Danish land. I think that they are even more pure bred than the flocks of our sister Association in Norway. Excuse me, Norwegian friends of the Old Norwegian Spael Sheep, but our Danish friends keeps both the attitude and the papers in order. Besides they have neither feral sheep (villsau) nor modern spael sheep to get blood renewal from. 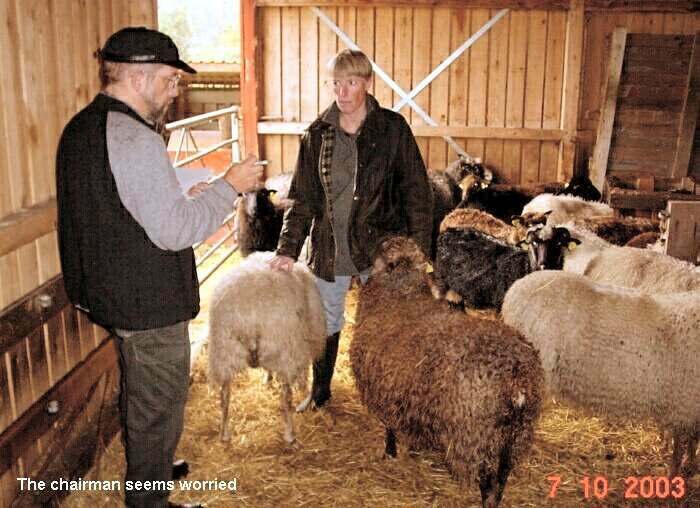 The biggest flock (75 ewes) belonged to Karsten Lægdsmand and Margrethe Agger. Margrethe is a tapestry weaver. The wool is extremely long and loustrous. "Perhaps the proximity to the sea makes the wool even better! ", she said. In fact half of all the flocks we saw lived close to the sea. Waiting for the ferryboat in the evening, we noticed a car with a typical Norwegian trailer for sheep. A proud sheep owner was admiring four sheeps of some meat race. Would have been interesting to speak to him, I though. Just before leaving the ferry at Sjaellands Odde I had a small talk with him:” Is it a mix between Old Norwegian and "texel sheep" you have got in the trailer? No but I have 21 Old Norwegians at home. And home was only ten kilometres from the hotel, where we were going to spend the night. We were surprised and lucky. Kjeld quickly registrated that the four sheep in the trailer were of English Leister race. After visiting the last flock on our way back towards Hanstholm, it was not difficult to conclude: Both written documentation, harmonizing expressions from the owners, and my own knowledge about Old Norwegian Spael Sheep says, that the most pure breed of Old Norwegian Spael Sheep you will find on Danish land. Thank you, Danish sheep owners, for being so careful when breeding the Old Norwegian Spael Sheep! You have to admit, that they are excellent animals!